The latest IHG PointBreaks list went live last week, meaning there’s a whole new batch of hotels where you can score discount award nights for just 5,000 points. Probably the most exciting property on the list this time around, which is available for bookings through January 31, 2014, is the InterContinental Resort Tahiti, and based on the reader comments on my post, I know a lot of you are excited about it and have booked awards there already, but are now wondering how to get down to the South Pacific. That’s why I thought I’d put together some ideas for how you can use miles to fly to one of the world’s top tropical destinations. I’ll be honest and say that there aren’t dozens of options, but there are a few decent ones that can get you without burning through a stack of miles. 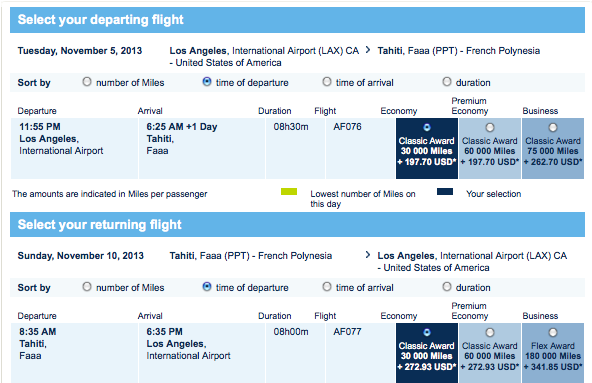 Both Air Tahiti Nui and Air France fly there from Los Angeles, and you can also route through Honolulu on Hawaiian. Meanwhile, just in case you’re coming from points further afield, it’s worth noting that Air New Zealand flies here from Auckland, Emirates and JetConnect from Sydney, and LAN from Santiago and Easter Island. This is one of those funny off-label flights that people tend to forget about, but Air France operates a non-stop flight from LAX to Papeete several times a week. As you can see, both the outbound and return are available in all three classes. 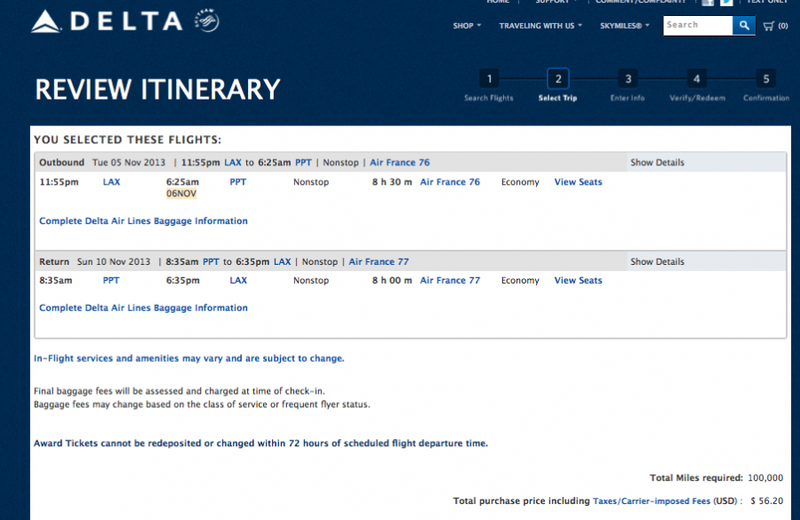 The one major drawback is that awards in Economy and Premium Economy incur carrier-imposed surcharges of nearly $400 roundtrip, and those in Business will cost you $600, so that’s something to take into consideration. However, it might still be worth going this route since tickets can be very expensive and even paying surcharges might be a fraction of the airfare. For instance, an economy ticket on the same dates would be over $2,000. And business class would be $3,460. Flying Blue might not be one of your primary programs, but it is a transfer partner of both Starwood Preferred Guest as well as Amex Membership Rewards, so you can always transfer points in to top up your account for an award. Delta: Delta doesn’t actually fly here, but remember that Air France is also a SkyTeam partner of Delta, so you can also use your SkyMiles to book an Air France award at the following levels. Though you won’t find as much award availability booking through Delta as you will directly through Flying Blue, there is still some and I was able to find awards on the same dates as above. 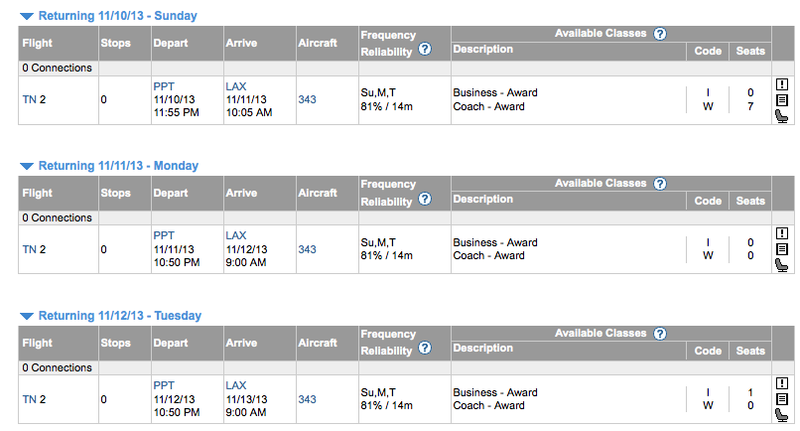 And business class awards are 150,000 miles + $56 as well, but Delta.com was not displaying them. I was able to call Delta and verify that there was availability, though, as well as the fees, so you might have to call in if Delta.com is not pulling in award availability. As I said, though, Flying Blue does release more award seats to its own members, so you might not be able to book award seats using Delta miles, especially in premium classes, even if you are finding them with Flying Blue. It’s a shame, too. Because I might actually book an economy ticket using Flying Blue miles even though the taxes and fees are higher since you’re saving 40,000 miles for about $350, or about 0.875 cents per mile. However, in business class, you are using the same amount of miles and getting much lower fees than booking through Flying Blue. Plus, Delta is also a transfer partner of both Amex and Starwood, so you can use either type of point to top up your account for a redemption. 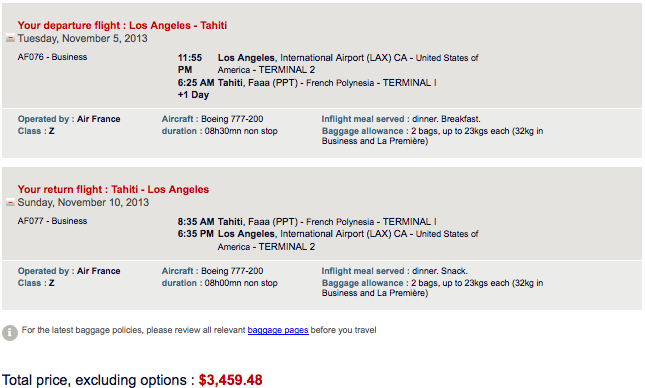 Alaska.com won’t display award space on Air Tahiti Nui, so you will have to call in to book directly with the airline. Taxes and fees are comparable to Delta – but as you can see, you need 20,000 fewer miles for economy and 30,000 fewer for business, so this is a good option to have even though Alaska miles can be harder to rack up and the program is only transfer partners with Starwood. 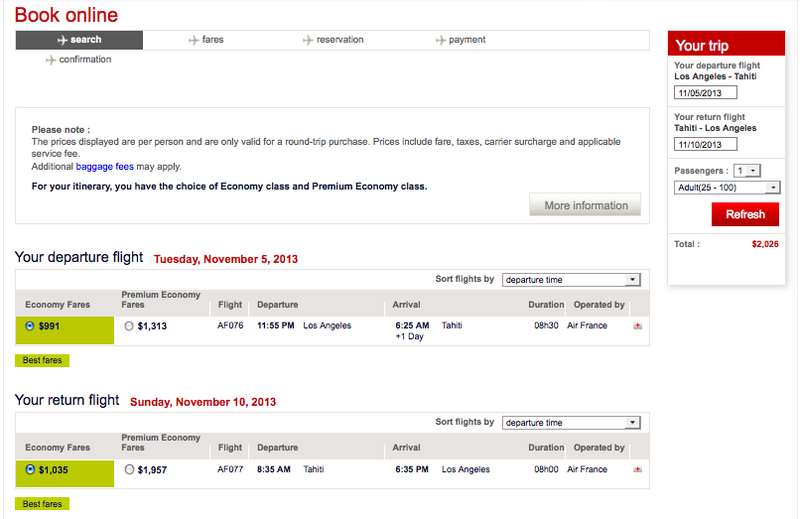 You can use ExpertFlyer to find Air France award space and then call Alaska to book open seats. Because as you’ll note in the chart below, awards from North America to the South Pacific are actually much more expensive, but there’s an exception for Air France’s USA-Tahiti flight. So while surcharges might be high, mileage levels are very reasonable and might be something to consider. 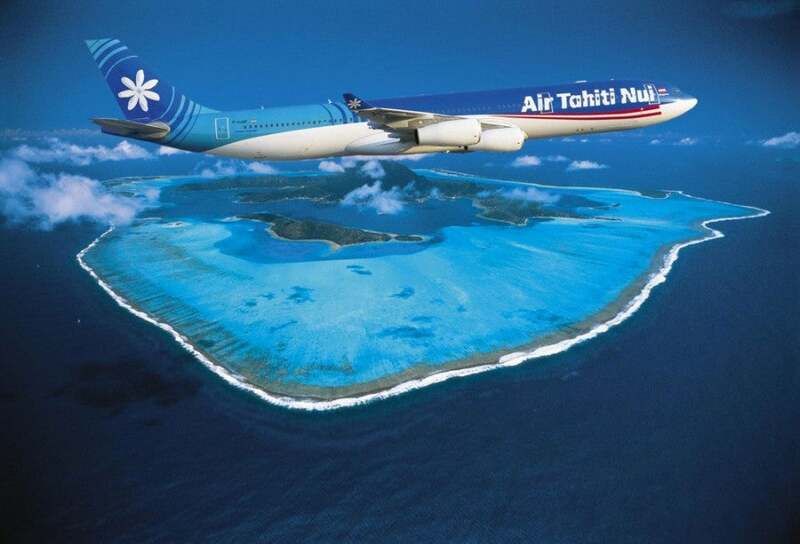 Though Air Tahiti Nui isn’t in an alliance, it is partners with American, so using AAdvantage miles is probably your best bet. 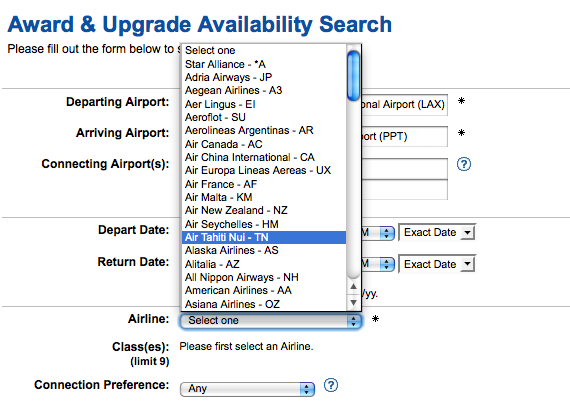 Air Tahiti Nui award availability does not display on AA.com, but you can find it using ExpertFlyer to search for economy and business space. With plenty of economy seats returning that Sunday and one business award on the following Tuesday. So that’s a handy tool. I called into American to check pricing on taxes and fees on both the economy and business class awards and was told that they would be $94.50 in either class. So you can search for both Air France and Air Tahiti Nui availability on ExpertFlyer and book the flights that work best for you. Those are pretty big numbers so I wouldn’t recommend this as a top choice, but there is a decent amount of award space and taxes and fees are just $5 each way. Also keep in mind that Hawaiian partners with both Korean Air (and there will be smaller fuel surcharges than on Air France) and American Airlines, so you can use miles from either of them to fly this route as well if there is award space. So it’s 45,000 miles for economy and 100,000 miles for first class – pretty decent, though it’ll take you a while to rack up those points thanks to Virgin’s revenue-based point program. 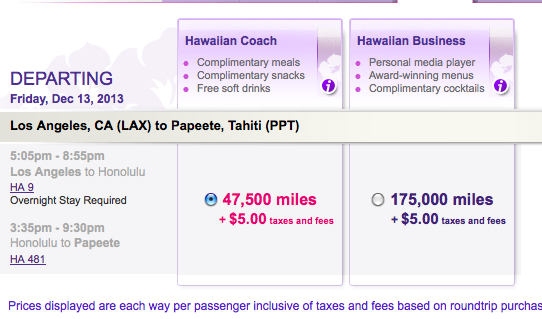 Still, 45,000 points and $59 in taxes is a pretty good deal for a roundtrip economy ticket, though. Plus Virgin America is a transfer partner of Amex Membership Rewards. So there are actually a lot of choices out there for those of you with SkyTeam or American miles as well as those of you who earn Amex Membership Rewards or Chase Ultimate Rewards. As with all mileage redemptions, though, look through your options and determine which combination of mileage and fees/surcharges is the right mix for you.